This week I have summed up the whole phrase that to me encourages us all to try to look for the positives in life. Plus I through in some stars as well! You know I love a one layer card! The colours where chosen to project my positive angle-we all need it sometimes! Our Guest Designer this week is Marilyn. Her card last week was amazing and this week she has another stunner to inspire you. Take a look at Marilyn's card here and also see what the Design Team have created for you. 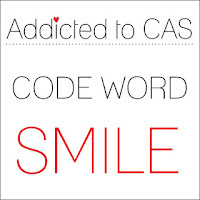 Addicted to CAS-Smile-a positive person smiles! 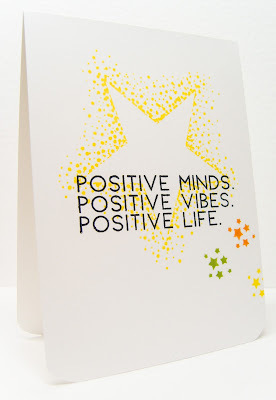 What a fun idea to use the Uniko stars with your Ton star and I absolutely love the clean look of the sentiment and the message itself! Wonderful one layer! Said this on IG...but this sentiment is so fabulous! Love, love, love!! Fabulous one layer card, Sandie! LOVE your sentiment so much, too! Thanks so much for playing along with us at Addicted to CAS! Terrific interpretation of the challenge. Love your card! Thanks for sharing at ATCAS! Great citrus colours - I love the words lstamped across the image like that. Good morning Sandie! My oh my, this card is so absolutely perfect on so many levels. 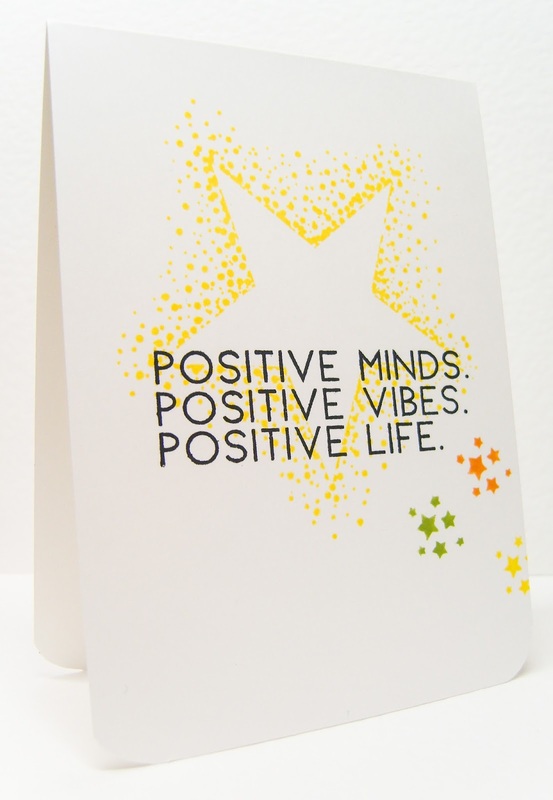 I do love that star from The Ton and I love the bright yellow ink... but the sentiment grabs my soul. I love this card Sandie... and you. This is a fantastic one layer card design. So pretty with all those stars. This is a fantastic sentiment--we should all remember them. And, I love how you have incorporated colors and stars into your designs. We love how you superimposed this bold sentiment over our Bokeh Star burst! Thank you for participating in our April Challenge! Love this card! Great star image and the sentiment is perfect for the challenge!